Delivery of constructs for silencing or over-expressing genes or their modified versions is a crucial step for studying neuronal cell biology. Therefore, efficient transfection is important for the success of these experimental techniques especially in post-mitotic cells like neurons. In this study, we have assessed the transfection rate, using a previously established protocol, in both primary cortical cultures and neuroblastoma cell lines. Transfection efficiencies in these preparations have not been systematically determined before. Transfection efficiencies obtained herein were (10–12%) for neuroblastoma, (5–12%) for primary astrocytes and (1.3–6%) for primary neurons. We also report on cell-type specific transfection efficiency of neurons and astrocytes within primary cortical cultures when applying cell-type selective transfection protocols. Previous estimations described in primary cortical or hippocampal cultures were either based on general observations or on data derived from unspecified number of biological and/or technical replicates. Also to the best of our knowledge, transfection efficiency of pure primary neuronal cultures or astrocytes cultured in the context of pure or mixed (neurons/astrocytes) population cultures have not been previously determined. The transfection strategy used herein represents a convenient, and a straightforward tool for targeted cell transfection that can be utilized in a variety of in vitro applications. The online version of this article ( https://doi.org/10.1186/s13104-019-4249-5) contains supplementary material, which is available to authorized users. Successful delivery of plasmid DNA or short/small interfering RNA (RNAi) is a crucial step for studying neuronal cell biology at a molecular level, through silencing and over-expression of wild type or mutant versions of a gene. Therefore, efficient transfection is important for the success of these experimental techniques especially in “challenging” post-mitotic cells like neurons. Various methods have been developed for introducing exogenous constructs into primary neurons such as electroporation (nucleofection), calcium phosphate, viral vectors and magnetofection [1, 2]. Each method has its own advantages and limitations. For instance, calcium phosphate is very inexpensive and easy to perform; but it has low transfection efficiency and is hard to reproduce being sensitive to pH, temperature and incubation time [3, 4]. On the other hand, transfection efficiencies as high as 85–95% were reported using nucleofection, however, this method has a number of limitations, mainly the need for special equipment and the immediate transfection of neurons after isolation . Similarly, high gene delivery rates have been achieved with viral vectors in primary neurons, but these vectors have a number of drawbacks; which include, special biosafety requirements, gene integration, limitations on the insert size, high-cost and labor-intensive . As for magnetofection, transfection rates of > 45% were documented for this method in primary motor neurons; however, this method requires special equipment and gives optimal results only with young (DIV2) neurons . Among the plethora of gene delivery methods, lipofection is considered the “gold-standard” to which other techniques are usually benchmarked. This is mainly due to its ability to efficiently introduce nucleic acids (DNA and RNAi) into a broad range of cell types, even difficult-to-transfect primary mammalian cells, using simple protocols that have shown high reproducibility and comparatively low toxicity [2, 4]. The continuing popularity of this method is reflected by the number of citing publications that have been on the rise since its launch in 1999. A quick Google scholar search returns over 51,200 articles for the term “lipofectamine” and 26,000 for the term “lipofectamine + neurons” (search conducted on 26th March 19). Lipofection efficiency has been previously assessed in primary cortical and hippocampal cultures [6, 7], however, these cultures are most likely mixed neuronal-glial preparations in which nor the proportion of each cell type, neither cell type-specific transfection efficiency was determined. Moreover, the reported estimations in primary cortical or hippocampal cultures were either based on general observations (no data was provided) or on data derived from unspecified number of biological and/or technical replicates. Here we present a quantitative evaluation of transfection rates in various neural preparations using Lipofectamine 2000®. This commercial formulation is widely used for gene delivery in fetal and neonatal primary cells [4, 8, 9, 10]. In this study, we used a previously established transient transfection protocol  and determined the transfection efficiency in 5 different types of rodent neural cultures. Animal handling and culling was carried out in accordance with schedule 1 of the standard guidelines on human killing of animals, whereby pregnant dams were euthanized by a trained personnel using CO2, while fetuses were euthanized by decapitation with surgical scissors. Cortical neurons were cultured from embryonic day 17.5 or 18.5 (E17.5/18.5) CD1 or C57BL/6 mouse pups as previously described . Dissociated cortices were plated at a density of 13 × 104 cells/cm2 in a 24-well plate. Three types of cortical cultures were generated: astrocyte-containing (AC), astrocyte-free (AF) and astrocytes enriched cultures (AE). Undifferentiated rat B35 and B104 neuroblastoma cells were routinely grown in 25 cm2 flasks and subcultured when confluent. Detailed information is provided in Additional file 1. Primary cortical cultures (on DIV7/8) or neuroblastoma cells (B35 and B104) were transiently transfected using Lipofectamine 2000 (Invitrogen) and pEGFP-N3 (Clenotech) following a previously described protocol . Primary cortical cells were transferred to serum free non-trophic medium 2–4 h prior to transfection. A DNA (µg): Lipofectamine (µl) ratio of (1:3.88) was applied to each well. For AE cultures and neuroblastoma cell lines, the same protocol was applied to cells at a confluency of 60–80% with two modifications: (1) cells were seeded in 6-well plates, (2) the recommended transfection medium was replaced with Opti-MEM™ I Reduced Serum Medium (Gibco, France). Neuroblastoma cell lines and AE cultures were transfected with pEGFP-N3:Lipofectamine ratio of (3 µg:11.65 µl/well). Whereas, AC and AF cultures were grown in 24-well plates and transfected with pEGFP-N3:Lipofectamine ratio of (0.6 µg:2.33 µl/well). At the end of the transfection period, the medium on the cells was replaced with either cell-conditioned media (primary cortical cultures) or fresh serum-free growth medium (for neuroblastoma and AE cultures) to prevent cytotoxicity. Finally, cells were fixed either 24 or 48 h post-transfection (hpt), before staining with the desired anti-bodies. Cell viability was determined using FITC Annexin V/Dead Cell Apoptosis Kit with FITC annexin V and PI, for Flow Cytometry (Invitrogen) according to the manufacture’s protocol. A more detailed description of the protocol is provided in Additional file 1. Immunofluorescence was performed as previously described . All anti-bodies used in this study are listed in Additional file 1: Table S1. Non-saturated images were acquired using Nikon epi-fluorescent microscope under a 10× objective lens. Image analysis was performed with (Image j) program. For primary cortical cultures phenotyping, we first quantified the total number of cells in each well, by staining the cells with the nuclear marker (DAPI) and excluding ones with pyknotic nuclei. Then percentage of neurons or astrocytes was determined by calculating the percentage of NeuN+ and GFAP+ cells in the total population (DAPI+). 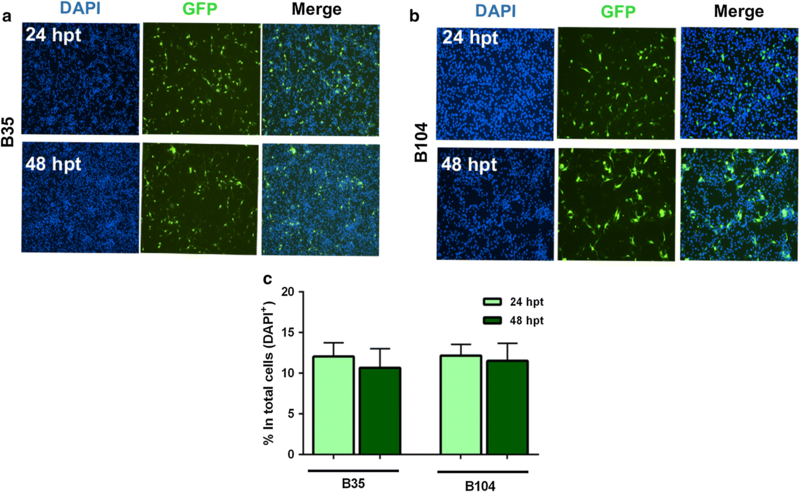 Transfection efficiency in the dividing cells studied here (B35/B104), comprising of a homogenous population of cells, was determined by quantifying the percentage of GFP+ cells within the total (DAPI+) population. Whereas in primary cortical cultures, the efficiency was determined at a cell-type level using cell identity markers. Different gene delivery strategies can have various cytotoxic effects which in turn can confound determination of transfection efficiency. We therefore have assessed toxicity of Lipofectamine-mediated transfection in our preparations. In general low cytotoxicity was observed for all tested neural cultures except AE. Lipofectamine showed the lowest toxicity in neuroblastoma B35 and B104 with cell death increase of only 5.2 and 7.1% from the baseline, respectively (Additional file 1: Fig. S1A, B). Similarly, good survival rates were achieved for AC and AF with only 11 and 12% increase in cytotoxicity levels over baseline, respectively (Additional file 1: Fig. S1C, D). As for AE, relatively high toxicity was observed even in non-transfected cells despite of their normal morphological appearance (Additional file 1: Fig. S2). The overestimation of dead cells may be due to false positive events resulting from PI staining of RNA (see Additional file 1). Considering the above, we applied an alternative method for estimating cytotoxicity in AE using DAPI nuclear staining and measured death by calculating the percentage of pyknotic nuclei in the total population. A modest toxicity was observed with a 17% increase in cell death levels over baseline (Additional file 1: Fig. S1E). Undifferentiated rodent neuroblastoma cell lines such as B35 and B104, are useful in vitro models of CNS for studying important aspects of neurobiology associated with neurodevelopmental processes such as differentiation, neurite outgrowth, cell migration and cell death [13, 14]. Efficiencies were determined at 24 and 48 hpt to allow for high transgene expression  (Fig. 1a, b). In B35 cells, efficiencies were comparable for both time points. 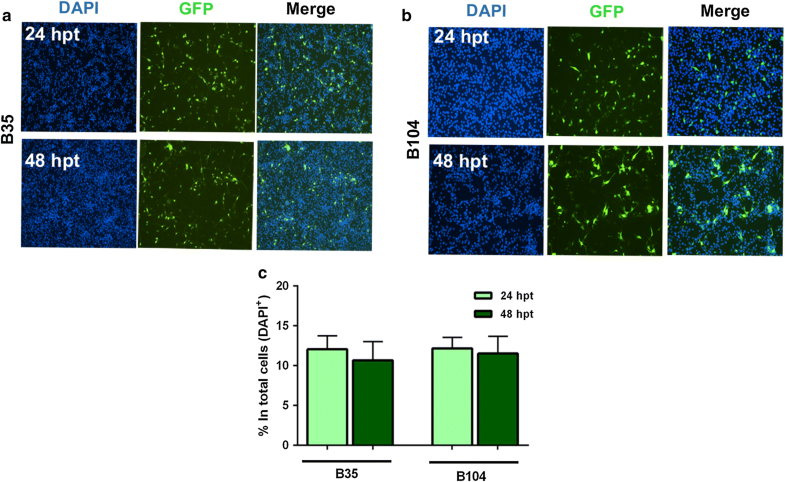 Moreover, similar rates were achieved for B104 cells (Fig. 1c). Unlike cell-lines, primary cultures contain heterogeneous population of cells. Therefore, we carried out cell phenotyping at DIV7/8 using the typical neuronal and astrocytic markers (NeuN and GFAP) (Additional file 1: Fig. S3A). The proportion of neurons and astrocytes was calculated as the percentage of NeuN+ or GFAP+ cells/total cell population (DAPI+ nuclei). Dead cells with pyknotic nuclei were excluded. Our AF cultures were almost completely devoid of astrocytes consisting of 99% neurons, while the AC cultures were composed of 90% neurons and approximately 10% astrocytes. The AE cultures, on the other hand, were predominantly astrocytic containing about 95% GFAP+ cells (Additional file 1: Fig. S3B). These findings are consistent with previous studies [16, 17]. The ability to generate different types of cortical cultures with various (neurons vs glia) proportions facilitates the study of these cells in the context of pure or mixed population cultures. This is important when investigating cell-type specific responses or cell–cell interaction. Here we have assessed the transfection efficiency in astrocytes when cultured alone (AE cultures) (Fig. 2a). Both tested time points gave comparable transfection efficiencies (Fig. 2b). To evaluate the transfection efficiency of astrocytes in our AC cultures, we performed transfections on DIV2. 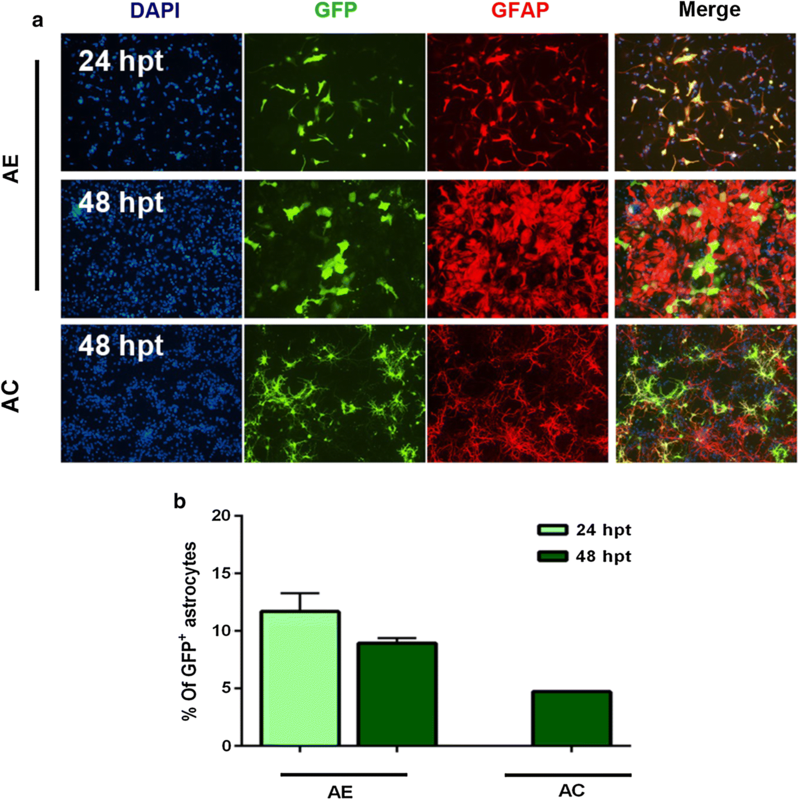 Introducing the transfection mixture at this developmental stage have been observed to preferentially transfect astrocytes in this type of cell culture . Assessment of the transfection efficiency 48 hpt, revealed that the GFP+ cells were predominantly astrocytes (74%) (Fig. 2a and Additional file 1: Fig. S4A). The overall percentage of transfected cells (total GFP+/NeuN+ and GFP+/GFAP+) was 6.4% of which 1.6% were neurons and 4.7% were astrocytes (Fig. 2b). We decided to assess the transfection efficiency of neurons at DIV7/8, a developmental stage typically chosen for carrying out transfections in primary neurons [8, 9, 10, 12, 18, 19]. 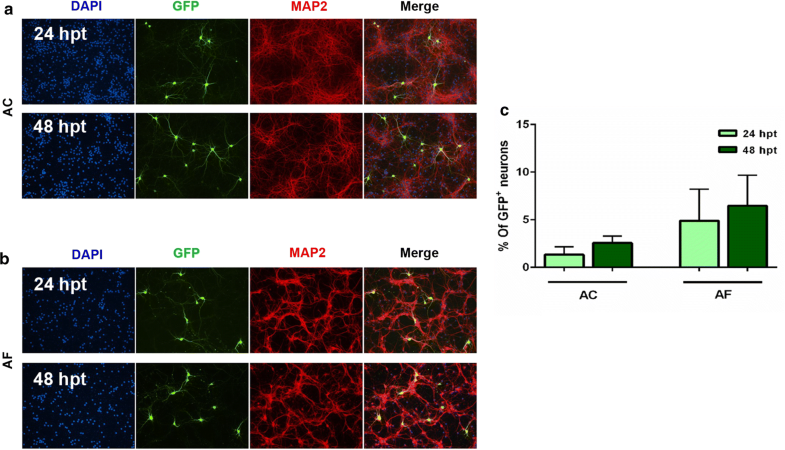 The protocol applied here reportedly selects neurons over astrocytes [11, 17], and in our AC cultures it almost exclusively transfects neurons (only 3 GFP+/GFAP+ cells were detected vs 1330 GFP+ neurons in a total of 84,685 cells analyzed) (Fig. 3a and Additional file 1: Fig. S4B). The achieved transfection rate was 1.3% and 2.6% at 24 and 48 hpt, respectively (Fig. 3c). As for the AF (cultures), a higher transfection rate was obtained (4.9% at 24 hpt and 6.4% at 48 hpt) (Fig. 3b, c). To our knowledge, transfection rate has not been previously determined in rodent primary AF “pure neuronal” cultures. However, the achieved transfection efficiencies in our primary neuronal cultures are within the previously reported range (1–5%) using the same method [2, 11, 17]. In an attempt to improve transfection efficiency, we trialed various Lipofectamine:DNA ratios and tested transfecting cells at DIV4 instead of DIV7/8. However, none of the tested conditions gave better results (see Additional file 1). In this study transfection efficiency was determined by testing a limited range of DNA: Lipofectamine ratio, also other more sensitive methods could be employed to evaluate transfection efficiency such as flow cytometry. Lipofection is a popular gene delivery method due, not only to its high gene transfer efficiency, but also due to other considerations such as ease of use, cost effectiveness, reproducibility and time- and labor-saving. To our knowledge, transfection efficiencies using Lipofectamine 2000 have not been previously assessed in neuroblastoma cells (B104/B35), nor in primary AF or AE cultures. Transfection efficiencies obtained here (9–12%) for neuroblastoma and AE cultures are low compared to other mitotic cell types [2, 20], while transfection levels achieved here for primary cortical cultures were within the reported range [2, 11, 17]. Achieving high transfection rates is crucial for molecular manipulations such as gene silencing to attain maximal gene expression inhibition, or for quantitative and biochemical applications requiring high yield of the transgene product (mRNA or protein). Low transfection rate, on the other hand, is also desired as it offers the advantage of using neighboring un-transfected neurons as internal controls. This is ideal for applications evaluating neuronal phenotype, survival or protein localization in transfected vs naïve cells. It is also preferred in live-cell imaging experiments studying synaptic vesicle trafficking and endosomal dynamics . 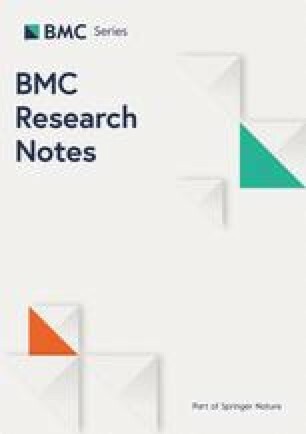 Knowing the transfection rates that could be achieved using a certain method and how to modify it to target a particular cell type (in the context of heterogeneous cultures), are two important aspects when considering the suitability of a given transfection method for the application of interest. The results reported here can offer guidance for researchers with this regard. However, optimal transfection conditions and efficiency using the method reported here may need to be empirically determined when using other cell types. AALA and BA: Performing transfections, immunofluorescence experiments and data analysis. HA and AM: Data analysis. SMP and AAA: Performing flow cytometry experiments. FHM and AMA: Supervision of animal mating and breeding. NAT: Data analysis and critical review of the manuscript. BRA: Conception of the original project design, experiments design, experiments execution, data analysis and interpretation, manuscript drafting. All authors read and approved the final manuscript. The authors thank King Abdulaziz City for Science and Technology for funding and supporting this study. The authors also thank Mr. Talal Alasmari and Mr. Alberto Jardin Capuno from the animal facility at the comparative medicine department in King Faisal Specialist Hospital and Research Center for their assistance with animal care and mating. The datasets used and/or analyzed during the current study are available from the corresponding author on reasonable request and are within the manuscript and additional files (Additional file 1). Donor rodent animals (the pregnant mothers and their pups) were handled and provided by experts form the animal house at the comparative medicine department, where the animal handling and culling was carried out in accordance with schedule 1 of the standard guidelines on human killing of animals and the Society of Neuroscience policy on the use of animals in research. The project was approved by King Faisal Specialist Hospital and Research Center ethical committee, basic research and ACUC committees (RAC#2160018). The authors thank King Abdulaziz City for Science and Technology for funding and supporting this study under the small projects program Grant Number م ص 37-324. The funders had no role in study design, data collection and analysis, decision to publish, or preparation of the manuscript. Additional file 1: Fig S1. Effect of Lipofection on cell viability. Fig S2. Cell viability of transfected and control AE culture. Fig S3. Phenotyping of primary cortical cultures. Fig S4. Neuron- or astrocyte-specific transfection in primary mouse cortical cultures. Fig S5. Correlation between total number of cells and the number of transfected cells.